For a good chunk of my life, I struggled with goal setting. Growing up in Wisconsin, I was taught that hard work was not only valued, but the key to success. So, when I started my business as an adult, I WANTED to be so busy I was working nights and weekends. After all, if I was working long hours, that meant that I was “successful.” Right? But sacrificing my mental and physical health was just the tip of the damage that mindset caused me. My workaholic tendency combined with my “Type A” personality also kept me constantly feeling like I wasn’t doing “enough,” no matter how many goals I checked off my list. I became obsessed with goal setting. I researched and tried many goal setting and time management systems. Nothing really worked. I also tried relying on sheer willpower—pushing myself to get more done (which was also not successful). So what was it that finally shifted goal setting for me? Digging more deeply into my love-based philosophy, and realizing my goal setting was built on a foundation of fear. What does that mean, exactly? And if your goal setting method is also built on a foundation of fear, how can you switch it to a foundation of love, instead? That’s exactly what I’m going to walk you through in this Goal Setting Checklist. You CAN set goals that you can bring to life easily and joyfully. And you CAN get more done—and be more efficient—without more struggle, overwhelm, and angst. Goal Setting Step 1: Get Clear. What Are Love-Based Goals Anyway? To me, love-based goals are whispers from your soul. Your soul wants you to step into the highest version of yourself. But, your soul also know that’s not easy. It requires you to face your demons and love your shadows. So, as you do that work, your soul whispers your love-based goals to you. And as you become that highest version of yourself, your “reward” is that those goals can finally come true. In other words, your love-based goals can only come true if you start to shift into the highest, best version of yourself. Your soul wants to keep you on track toward achieving your love-based goals, so you can live your best, happiest life. Now, on the flip side, in many cases, one of the main reasons why your love-based goals haven’t come true is because they don’t match your current identity. For instance, let’s say you’ve always wanted to write a novel, but the years have gone by and you’ve never even written a paragraph. Why is that? Because your current identity sees yourself as a wanna-be author, NOT an actual author. That’s why taking the time to change your identity so it matches your love-based goals is key to having your love-based goals come true. So, how do you change your identity? Keep reading — the next 3 goal setting steps are a good place to start. How do you know if you have love-based goals, or “regular” goals? One big indication of a love-based goal is if you have a big dream you’ve been talking about your entire life, yet somehow, you’ve never gotten any traction toward realizing it. Now, it’s possible that big dream is not a love-based goal, but what I call a “should” goal. A “should” goal is a goal you feel like you “should” be working on, but it doesn’t actually reflect your deepest desires. How can you tell the difference? I recommend doing some journaling around your perfect day. (No, I’m not talking about a vacation day here, but a perfect work day.) What are you actually DOING during your perfect work day? How is your day structured? Where are you living? Who is around you? While you’re doing this exercise, take note of how you’re feeling. Are you getting excited? Are you tapping into your passion? Or does it feel like you’re still doing something you “have to,” or maybe even dread? This exercise is a great way to differentiate between love-based and “should” goals. Goal Setting Step 3: Be Prepared for What Can Stop You. If you’ve designed your life around “should” goals, it’s probably not difficult to understand why you haven’t gotten any traction on them. But, what about your love-based goals? Why haven’t they come true? Typically, there’s something going on either internally or externally. If it’s an external problem, it’s usually around not having found the right goal setting system for you. 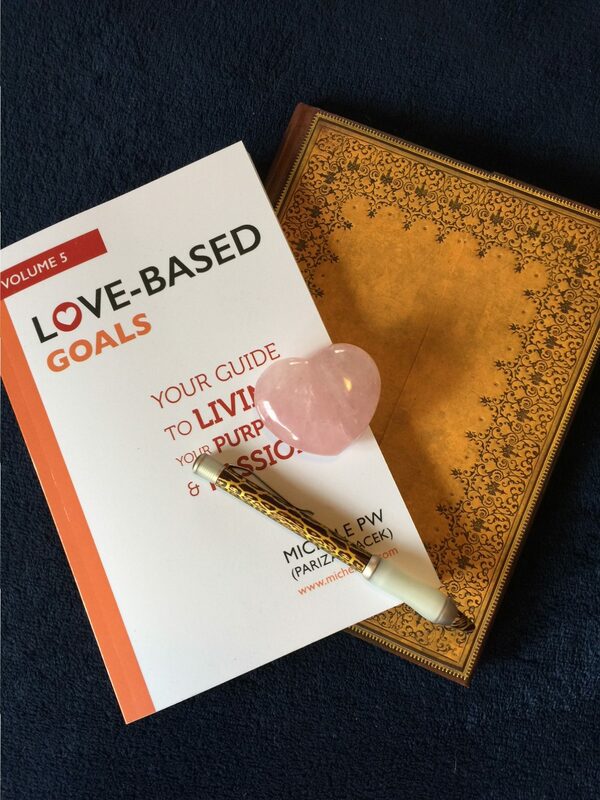 In my “Love-Based Goals” book, I dig into a variety of goal-setting methods, to give you options so you can find one that feels right for you. It’s also pretty easy to do your own research, with a little help from your favorite search engine. If it’s an internal problem (which I suspect is the real culprit, more often than not), well, that’s a little trickier. Generally speaking, if something is going on internally, it’s directly related to blocks in your mindset or subconscious. Maybe you find yourself procrastinating every time you sit down to work on your goals. Or maybe you lack focus. Or maybe you can never find the time. Or maybe you find yourself constantly feeling worry or resentment or anger or sadness or jealously or guilt every time you sit down to work on your goals. And, because you feel so crappy, it can’t possibly be a good goal, right? It must be a sign you shouldn’t be working toward that dream. Goal Setting Step 4: Set Yourself up for Success. While feeling your fear-based emotions and still taking action is never going to be easy, there are things you can do to increase your odds of being successful. • Start and maintain a morning practice (so rather than check email, start your day with self-care practices such as meditation or journaling). • Use rituals, such as a New Year’s Day ritual to help you create a supportive container around making your goals come true. • Give yourself a break! None of this is easy. Give yourself the time and space you need to let your emotions move through you. Drink plenty of water, exercise, rest. And, above all, don’t beat yourself up if it’s not happening “fast enough.” Chances are, it’s happening plenty fast enough and surrounding to the process and allowing it to unfold the way it wants to is the best gift you can give yourself. If you’d like to dig more into making your love-based goals come true, you may want to check out my “Love-Based Goals” book. Grab your copy here.